My good thoughts go out to this good fellow and those that fell at Charlottesville. Is that photo 'shooped or is that just some odd perspective that makes it look like a giant man shoo’ing away tiny people? yeah, someone please explain this. It’s freaking me out. makes it look like a giant man shoo’ing away tiny people? That’s what it is, regardless of any pixels you might see. Chasing a nazi embiggens the smallest man. We need an official boingboing explanation, what’s going on with that picture? They don’t quote him as saying it was torch fuel, but it seems like a reasonable assumption. This is going to get a lot worse before it gets better, and ignoring them won’t help. A classic gang of bullies trying to work up the nerve for larger atrocities. They had a permit for the Saturday event (as various a-holes keep repeating), but did they have anything for the Friday night? Ok, so does anybody else find it a little insane that this guy’s claiming victimhood because he was hit as he chased a man down the street with a group that was actively attacking him? Tyler D.R. 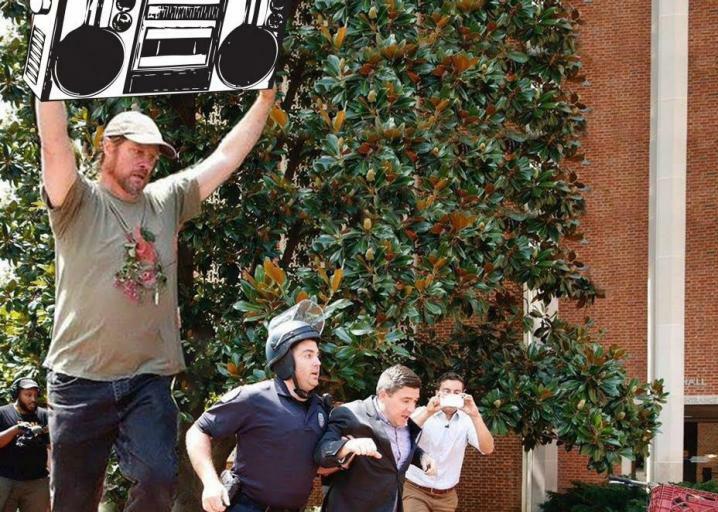 Magill, an employee with the University of Virginia’s Alderman Library, suffered a stroke Tuesday that may be related to injuries he sustained in a violent melee with white supremacists on the university’s Lawn Friday night, a friend of his family confirmed Wednesday. The attack happened before he chased what’s-his-fascist, though the featured (authentic non-edited) image shows the latter event. If you read for clarity, he was hit the day before when his side was outnumbered and the injury led to the later stroke. Who in the Municipal clerk’s office thought nothing could go wrong with issuing a rally permit? National Guard and Police were monitoring rally. The skeptic wants to suggested a contrived intervention. I can’t prove this, but people are saying he’s close to 8’4". It’s not just me, A lot of people are telling this to me. And don’t I surround myself with the best advisers? This video doesn’t give enough context if you don’t know who the speaker is. Kind of makes the counter protesters look bad - he is denouncing the violence, and then is swarmed? Good lord — I just learned Tyler is a close friend of my wife’s family. My brother-in-law co-hosts a radio show called Radio Wowsville with him. Tyler Magill was put in the ICU by neo-Nazis, but he will hopefully be back on the radio in no time.